It’s that most wonderful time of the year again. In central squares in towns and cities across Europe the sweet steam of Glühwein and hot cider mingles with the smell of fresh cut pine, cinnamon and gingerbread. 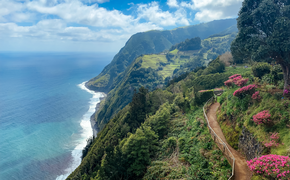 The clutter of Christmas Markets with their wooden stalls and streets scattered with hay offer a version of Christmas that’s a perfect antidote to the grim chronicles of Black Friday where the happy throngs have morphed into angry mobs. Christmas markets in Europe bring out the best in Christmas. People stand in the cold sipping wine and talking as if it weren’t cold at all. After a few hours it becomes hard to remember that Christmas was once a Middle Eastern story. Over the years Europe has made the Nativity into a story of its own by dressing it up in its own rich folk traditions. No one knows the actual birth date of Jesus, but Dec. 25 was chosen in the fourth century by Pope Julius I in order to create a celebration of the birth of Jesus and to vitalize it with the traditional Dec. 25 celebration of the Roman Saturnalia. Pre-Christian Germans celebrated a midwinter festival they called the Yule. The authentic feel of a German Christmas Market is rooted in the fact that the celebration reaches deep into the Pagan celebrations. Once Christmas Day was established it wasn’t long before the season of Advent began to enthrall Europe. Christmas markets, the chief symbol of European Advent are believed to have begun in Dresden whose Striezel Market dates back to 1434. While Christmas Markets have taken root all over the world, Germany is still their home. About 150 German towns and cities have Christmas Markets. Berlin alone has 60. The wooden stalls used in the markets suggest the manger where the Holy Family received the three Eastern Kings bearing spices and incense. Those spices are suggested in the aromatic warmth of allspice, cinnamon and cloves that wafts out of vats of steaming glühwein, the mulled wine that comes out at Advent. Even in such big cities as Berlin, Frankfurt, Hamburg and Munich the markets establish an authentic connection to the medieval village each with its own traditions. Weimar, for example, became the first German city to put up a public Christmas Tree. In 1815, Johann Wilhelm Hoffmann, a bookseller, erected one outside his shop for the poor and for orphaned children. To this day Weimar’s Christmas Market in the town’s Market Square remembers Hoffman’s gesture with a majestic spruce tree dressed to the nines. The Weimar Christmas Market also stays open until Jan. 5, while the others mostly close on Christmas Eve or Christmas Day. The market in Nuremberg’s Hauptmarkt Square is called the “Little Town of Wood and Cloth” because of its signature red and white ribbons festooning the stalls. The market in the Marienplatz is the oldest of Munich’s 17 markets. Rothenbürg’s Reiterlesmarkt sits within the walls of the medieval city on the Romantic Road. Regensbürg’s market surrounds the Neupfarr Church. For something completely different, Baden-Baden’s 19th century Kurhaus spa and park is the backdrop to the Christkindelsmarkt. At Stuttgart's Christmas Market merchants in historical costumes peddle their wares as dyers, felters, blacksmiths and glass blowers demonstrate traditional crafts. Berlin will cap off the season with an estimated one million people celebrating in the largest New Year's Eve Open Air Party in the world at Brandenburg Gate. Christmas Markets can now be found in cities throughout Europe and the Americas. The fact that Germany is the home of markets doesn’t take anything away from such great markets as those in Prague, Budapest, Paris, London or my favorite in Salzburg. 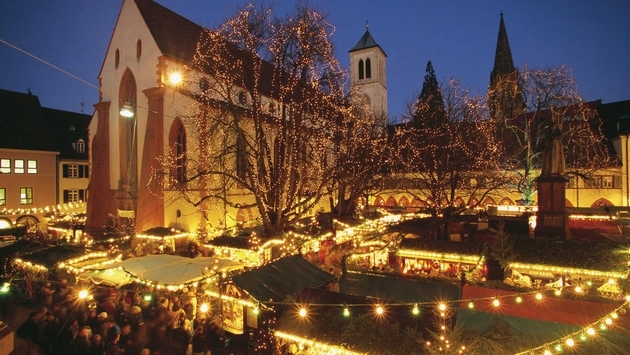 For a list of great German Christmas Markets visit www.Germany-Christmas-Market.Org.UK.